While it is true that the British North America Act, 1867 marks a point of departure, it is also just another step along a treacherous path of constitutional crises. This was especially true for the two largest parties in the new federation. On 1 July 1867 it became possible, for the first time, to describe Nova Scotians and New Brunswickers as “Canadians.” The coolness with which this change was received in the Maritimes is discussed below. Names changed, as well, in the old “Province of Canada.” The changing nomenclature and identities might appear to be cosmetic, but they were much more than that. While it is true that delegations from Canada West and Canada East were present at the constitutional discussions in Charlottetown and Quebec City in 1864 and in London in 1866, the fact is they represented one colony, not two. The Province of Canada — created by the Act of Union in 1840-41 — was a single entity hinged at the middle, along the Ottawa River. The BNA Act thus simultaneously divided Canada into two provinces and united what was Ontario and Quebec into a federal system. Unification, that is, was predicated on division. Why was this the case? The Act of Union was the fourth Canadian constitution since the Conquest in 1763. Like its predecessors (the Royal Proclamation of 1763, the Quebec Act of 1774, and the Constitutional Act of 1793), the Act of Union contained measures for the management of the French Canadians. The Act of Union was less concerned than the earlier efforts with the Catholic Church in Canada, but it was built on the premise outlined by Lord Durham’s 1839 Report on the Affairs of British North America that assimilation of the French Canadians was essential to the future of the larger colony. Giving an equal number of seats to predominantly French-Catholic Canada East and almost wholly English-Protestant Canada West advantaged the anglophones because Montreal (in Canada East) was an important and politically powerful node of anglophone parliamentary seats. The Act of Union effectively reunited anglophone Canada West with anglophone Montreal (and outlying anglophone constituencies as well), creating what Durham imagined would become a majority Anglo-Protestant government. That is not, however, how things turned out. Ideology stepped in to complicate linguistic and sectarian differences. Reformers and Tories, Rouges and Bleus, along with an assortment of smaller parties, turned Durham’s famous phrase inside out. Instead of “two nations warring within the bosom of a single state,” Canada’s political culture quickly evolved into factions of two nations who occasionally cooperated within the bosom of a united colony. There were, of course, issues that kept potential allies apart, and by the late 1850s it was virtually impossible to forge a coalition in the Legislative Assembly that could muster enough votes to build a government. Non-confidence motions spelled the end of one administration after the next. Some politicians and commentators felt that Canada was effectively ungovernable under these circumstances. Two critics of the status quo were also two of the most effective participants when it came to exploiting its weaknesses. George-Étienne Cartier and John A. Macdonald dominated the colony’s administration from 1857-1862. Out of power for the next two years, they were nevertheless able to hobble the Clear Grit administration of John Sandfield Macdonald (unrelated to John A.) and wrestle his chief ally, George Brown, into a new Great Coalition in 1864. The Cartier-Macdonald-Brown alliance had two primary goals: resolving the impasse that the Act of Union created and acquiring new territory for agricultural settlement. Brown, the Grits, and much of southern Canada West (Ontario) were increasingly concerned about the shrinking amount of available farmland in the colony. The Americans were extending their reach deep into the “New Northwest” of Illinois, Wisconsin, and Minnesota. Rupert’s Land, just to the north, was vulnerable to the expansionist Americans and desirable to the Ontarians. A commitment on the part of Cartier and Macdonald to acquire Rupert’s Land secured the Grits’ agreement to explore the prospect of dividing the Province of Canada once again and forging a federal relationship between the two partners. Happenstance and a bit of vision allowed the Canadians to expand this prospective union to include other British North American colonies. There are distinctive features to this process. For all intents and purposes, colonial politicians were writing their own constitution for the first time. All previous constitutions had been imposed by the British regime. Some, if not all, of those earlier efforts reflected the British experience with the Thirteen Colonies that became the United States. Too much legislative autonomy might create forums for unrest and revolutionary talk. Better to have a handpicked local and loyal Executive, at least that was the view until the 1840s. At that time, British enthusiasm for Free Trade in the age of laissez-faire capitalism was taking off. It raised the question of whether old-style, mercantilist colonies like the Province of Canada or Nova Scotia were consistent with new economic and market philosophies. On the whole, the British realized there was a contradiction and began cautiously allowing for colonial responsible government (that is, making the Executive responsible to the majority of votes in the Assembly). Responsible government came first in Nova Scotia, then in Canada (both in 1848). 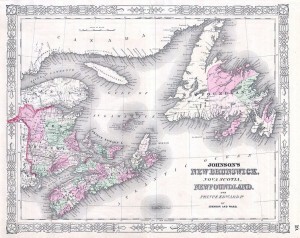 It was allowed subsequently in Prince Edward Island (1851), New Brunswick (1854), and Newfoundland (1855). By the time of the September 1864 Charlottetown Conference of colonial leaders, each of the colonies had experienced nine to sixteen years of trying to make their constitutions work (as opposed to decades of criticizing their failings). It is also important to note that no one in the Great Coalition could say for certain how this would turn out. Separating Canada West from Canada East might create competitive units incapable of cooperating on economic goals. Macdonald believed in the ability of the federal level to moderate those tendencies and to override provincial autonomy when it came to the cross-boundary movement of goods. But that had to be tested to destruction in the laboratory of constitutional practice. In short, there were risks. No colony more desired a federal system than Canada West (Ontario): Its economy was rapidly expanding; its towns were growing into cities; production was industrializing; and the population was increasing at a prodigious rate. The political stalemates of the 1850s and 1860s were holding it back, and the Anglo-Protestants of the inland colony inevitably regarded French Canada as a drag on their progress. Did the soon-to-be-Ontarians seek the elimination of the French language and the Catholic religion? Certainly some regarded the Church as a secondary and competing centre of authority whose influence was governed from Rome. But most folks in Canada West saw far more Irish Catholics than French Catholics in the course of a lifetime. Cartier and Macdonald, not to mention Baldwin and LaFontaine before them, demonstrated that collaboration was possible, but autonomy would be better. And at the federal level, the Anglo-Protestant interest would be inflated by members from Nova Scotia and New Brunswick. Best of all, the influence of Montreal would be reduced and Toronto could really spread its wings as the centre of influence west of the Ottawa River. Canada East approached the question with more equanimity. A French-Catholic dominated provincial Assembly was appealing. No less than Canada West, Canada East had suffered from sluggish administration during the years of political quagmire, and no one among the Franco-Catholic political community could forget that the Act of Union had, at its heart, the goal of assimilation into an Anglo-Protestant mould. George Étienne Cartier had worked non-stop since 1840 to manage the constitution that bound the two Canadas together; he achieved much by asserting Canada East’s power to control the Assembly and thus the Executive. His pre-eminence in political circles for more than two decades created the very logjam that Brown wanted to dislodge. Cartier’s strategy in the 1860s was to forego complete independence as unachievable, and pursue a federal union instead. Cartier’s Francophone opponents in Canada East wanted more and less at the same time: If they were going to enter a new era free of Canada West then independence and, possibly, annexation to the United States was preferable to a federal union with the Ontarians; conversely, the status quo was working out rather well for Canada East’s interests — there were good reasons to object to change of any kind. Cartier’s enemies, moreover, complained that he gave away too much at the Charlottetown and Quebec conferences. Francophones would be outnumbered by anglophones in the federal Assembly, which was a little like handing the English-speakers the rep-by-pop they’d been clamouring for since 1851. Cartier’s pro-Confederation side won the day, albeit narrowly. This victory was the sine qua non of Confederation: If Cartier had failed, then the whole project would have crumbled. Pragmatic Quebec politicians thereafter looked for ways to make the new system work to continue preserving French culture and values, while promoting their economic advantage and while retaining a historically-rooted fear that things might turn out badly in this sea of anglophones. First and foremost, the federal solution was the answer to a Canadian question. The Atlantic colonies weren’t constitutionally disputatious: They had no Constitutional Act to throw off; there was no Act of Union that forced them to work together; and no colonial culture was regarded as inferior when compared to any other. Assimilation was simply not an issue for anyone in mainstream society in the four colonies (although Aboriginal and Acadian peoples were constantly confronted by assimilationist attitudes). 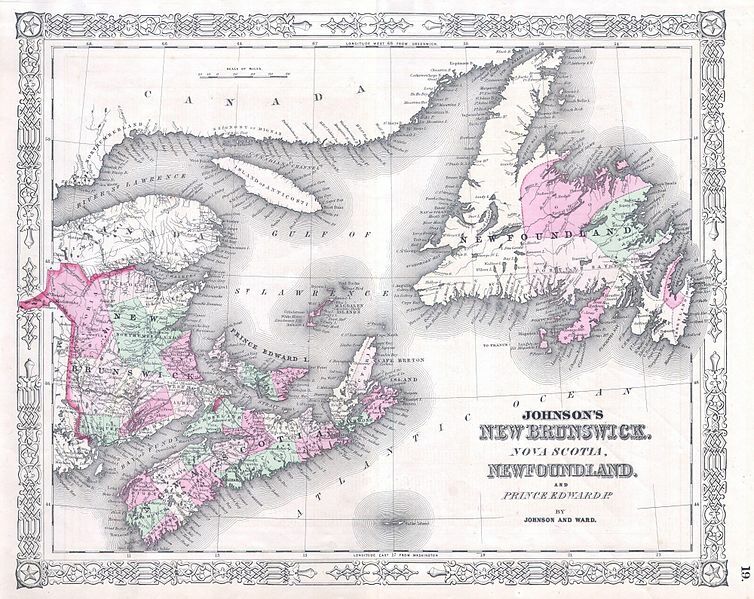 The principal question before the three Maritime colonies, in 1864, was whether it made sense to reunify the region, to restore the shape of 18th century “Nova Scotia” so that it once again included PEI and New Brunswick. It was over this issue — Maritime Union — that they assembled at Charlottetown when the Canadians came calling. A union of the three colonies — PEI, New Brunswick, and Nova Scotia — was endorsed by Britain, and the local economic elites for the most part agreed. The Reciprocity Agreement with the United States was still in effect (the Americans would cancel it in 1866) and trade around the whole of the Atlantic Rim was generally thriving. But these were three small colonies — small in area and small in population — that had to adjust to Britain’s retreat from direct colonial involvement and support. Each of the four Atlantic colonies had three possible options. First, unite with one or two or three other regional colonies. Second, pursue the Canadians’ suggestion of a larger British North American union. Third, carry on with the status quo. Half of the Atlantic colonies chose the Canadian path, and the other half chose the status quo. New Brunswick — the “keystone” colony — had a role to play in bridging the geography and economy between the St. Lawrence colony and Nova Scotia. There was resistance to the idea of union with the other colonies, and in 1865 it took the form of an Anti-Confederation Party. Led by Albert Smith (1822-1883), a Conservative politician, the Party pulled into its ranks a small but vocal cross-section of New Brunswick figures. The resultant alliance of Tories and Reformers won the general election in 1865 but were defeated by the Confederation Party in 1866. With a fresh and massive majority, the Confederationists pursued what they viewed as a comprehensively good package: defense against the United States and its Fenian armies, a completed railway, Canadian goods pouring through the ice-free port of Saint John, and a protected Dominion market for New Brunswick products. The Nova Scotians were also prepared to come on board with Confederation. Like the merchants of Saint John, the Haligonians saw themselves as probable beneficiaries of Canadian plans for an ice-free port. A railway across New Brunswick and the Chignecto Isthmus would connect the industrial heartland of Canada East to the largest Nova Scotian port. Halifax, Sydney, and Yarmouth were already leaders in shipping production; handling more Canadian exports and more foreign imports would be a further boon. By the same token, the Nova Scotian economy was resilient and far reaching. Opposition existed and was narrowly contained in the lead up to 1 July 1867. There existed in the province fear that the Canadian giant would overwhelm the smaller Maritime economies and that the federal government (sure to be located in Ottawa rather than a Maritime centre) would be heavily dominated by Ontarians and Quebeckers. These fears continued after the BNA Act was proclaimed, and are considered further in Section 2.2. Both Newfoundland and Prince Edward Island demurred when the offer arrived to join Confederation. Newfoundland traded little with the other British North American colonies, its cultural and economic orientation was toward Europe (with some West Indian trade as well), and its economic circumstances were on the rise (see Section 2.13). While the Canadians and New Brunswickers might have been motivated to bond together in mutual defense against American or Fenian attacks, those threats did not resonate in St. John’s, Newfoundland. What’s more, if Newfoundland had to defend itself against an assault on its territory, such an attack would come from the sea — precisely the same place from which the colony would be defended. The Canadians and the Maritimers had no navy, nor were they likely to get one soon. Britain’s Royal Navy, on the other hand, dominated the Atlantic. Jeopardizing that protection in the hope that some benefits might be forthcoming in the future simply did not appeal to the leaders of Newfoundland. Creating Confederation meant dissolving the union of Lower and Upper Canada. Each colony had its own particular reasons for entertaining or rejecting Confederation. The attractions of Confederation were not evenly felt. Johnson’s New Brunswick by BotMultichill is in the public domain. 1.5 Constitutional Crisis by John Douglas Belshaw is licensed under a Creative Commons Attribution 4.0 International License, except where otherwise noted.